“It is better to practice a little than talk a lot” – Muso Kokushi. Many people ask about starting to train and beginners’ classes. 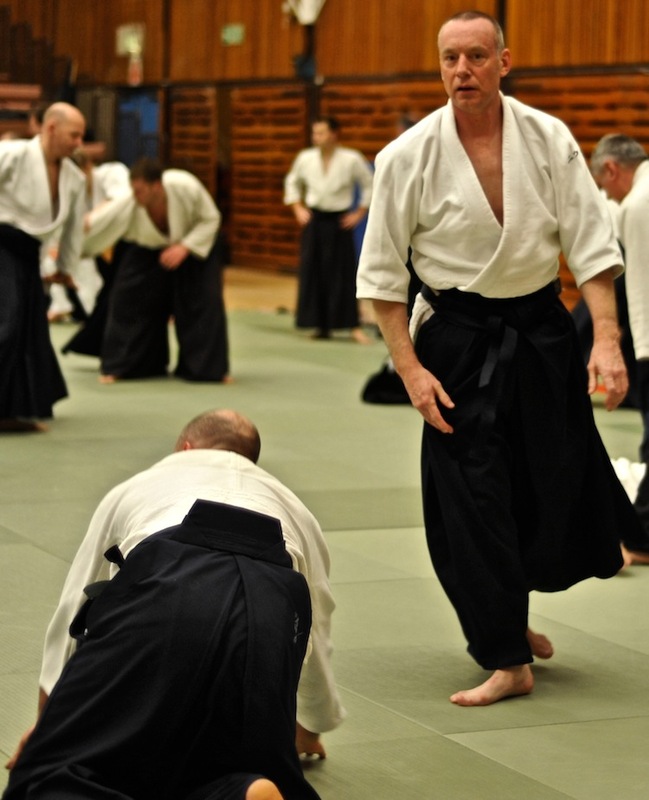 The best way to begin is to come to training and join in, Aikido has to be experienced. We do not run specific beginners’ classes because Aikido is learned as much from your training partners as from the teacher, so it is best to practice with experienced partners, not just other beginners in order to make the best progress. Grab the black belts, beginners take precedence, everybody is there to help! Bring loose, long sleeved, preferably cotton clothing and sandles for your feet. There is no need to buy uniform until you are sure you want to continue training. Aikido can easily be dangerous, so we must practice in a cooperative and consenting way, taking responsibility for our partners. In this way potentially painful or demanding technique can be practiced step by step, under control and happily, injury is rare. This said, Aikido is great fun to practice and will reward generously in proportion to the time and effort invested, for many people it becomes a way of life. Aikido decides life and death in a single strike, so students must carefully follow the instructor’s teaching and not compete to see who is the strongest. Aikido is the way that teaches how one can deal with several enemies. Students must train themselves to be alert not just to the front but to all sides and the back. Training should always be conducted in a pleasant and joyful atmosphere. The instructor teaches only one small aspect of the art. Its versatile applications must be discovered by each student through incessant practice and training. In daily practice first begin by moving your body and then progress to more intensive practice. Never force anything unnaturally or unreasonably. If this rule is followed, then even elderly people will not hurt themselves and they can train in a good atmosphere. The purpose of Aikido is to train mind and body and to produce sincere, earnest people. Since all the techniques are to be transmitted person-to-person, do not randomly reveal them to others, for this might lead to their being used by hoodlums. Make sure your gi (training suit) is clean, personal hygiene is exemplary, nails are cut short, loose hair tied back, any jewellery removed – for both your own and partners’ safety. Wear something on your feet (zori are traditional Japanese open sandals) to cross from the changing room to the dojo and on entering, perform a standing bow in the direction of the Kamiza (shrine, usually a picture of the Founder.) Walk to the mat, remove your zori and perform a kneeling bow (rei) again to the Kamiza. If you are late and the class has started, wait for the teacher to beckon you on to the mat. While the teacher is instructing, all students remain seated in seiza which is the correct way to remain at rest on the mat at all times. If this becomes painful, cross legged is acceptable except in formal clubs. Do NOT sit casually or lean against a wall. When standing from seiza, right knee lifts first. To begin training, pick a partner and make a bow. It is polite to repeat “o-nagai-shimas.” Lower grades make request to higher grades, whose obligation it is to help. Do not leave the mat during training. If you are ill or injured, ask permission of the teacher first. If you are waiting for more than a few moments, you should sit in seiza. If the teacher demonstrates specifically to you, again wait in seiza and perform a bow when the teacher is finished. This also applies if the teacher is working nearby, you may stop practising, sit down and watch if you wish. NEVER try to force or overcome your partner, your duty is to protect them. Do not argue about technique, you are there to practice and help your partner, not impose ideas on anybody else. Respect the higher grades, you can recognise them as they wear hakama (traditional divided skirts) from 2nd kyu, or black belt with hakama from Shodan. When the teacher stops the class (often by calling “yamae” and/or clapping) stop immediately, bow to your partner and line up in seiza to await instruction. The class ends in the same formal manner as it began, except that the phrase “domo ari-gato gozai mashta” is used, meaning “thank you very much.” Wait until the teacher dismisses you. It is then polite to make a kneeling bow to your last partner and leave the mat, bowing to the Kamisa at the edge of the mat and performing a standing bow on leaving the dojo. Replace your shoes to walk from the dojo. No eating, drinking, smoking or lazing around in the dojo. 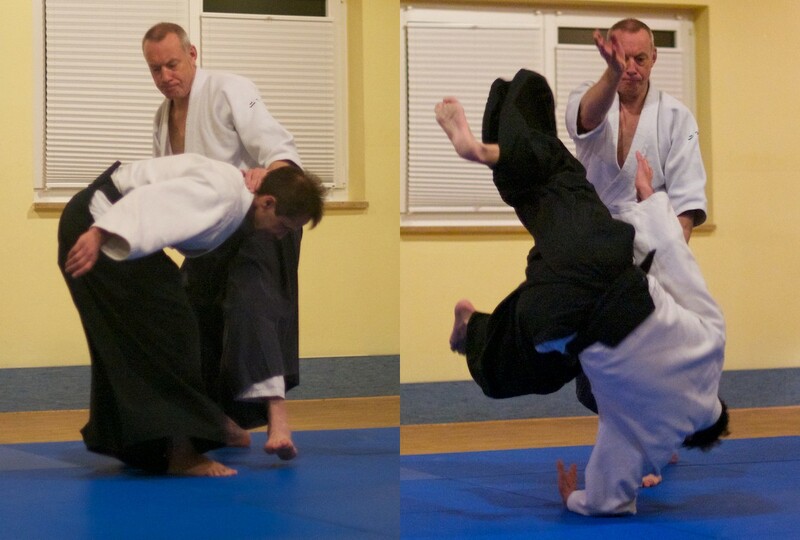 Aikido should be enjoyable to practice, not a chore. It is not a religion, rather a cultivation of the body and spirit, open to all.